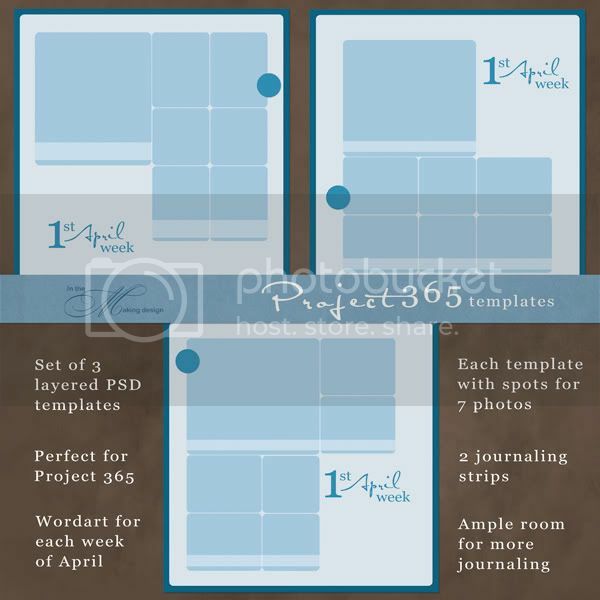 So we've arrived at the fourth and final set of freebie templates for P365 that I have created. With this there are twelve matching, but different, templates to keep you covered for the whole year. Of course, even if you aren't doing P365 you can certainly use these templates for other things as well. Included is also the wordart for April. I decided I will put up the wordart for the rest of the year in a seperate post so if you want that you will just have to wait! You can download the set here. As always, please read and follow the TOU! Thank you very much! Thanks for sharing these awesome templates. You are so generous! Thank you for sharing your creativity so generously with us! I love the look of what you create! Thanks again for more of your wonderful templates. They are excellent and will be used by me as I create my 365 pages. Could you possibly share what the font is you used for the months. I would like to add weekdays on some of the layouts and would like to use the same font? Thanks again for creating and sharing your templates with us! I've done 7 layouts thus far and have a lot more photos to go thru. The project is looking great thanks to you! Thank you so much for this Freebie. I want to let you know that I posted a link to your blog in CBH Digital Scrapbooking Freebies, under the Page 5 post on Jan. 17, 2010. Thanks again. Jody, I have used two fonts for the wordart; Satisfaction and Georgia. Georgia should be a standard font but you will need to purchase Satisfaction (I haven't seen it for free anywhere). I love your P365 templates! Thanks so much! Thank you! Your blog post will be advertised on the CraftCrave DigiFree search engine today (look for timestamp: [18 Jan 12:50am GMT]). Thanks for the font info, Linda. Very much appreciated as is all you do for us. Thank you for these amazing templates. I love them! This has been a wonderful series you've done, not to mention very generous! Thank you! Thanks so much. I love the clean lines of these templates. THank you very much for the 365 templates! !